Everyone wants fairer skin complexion, because skin color plays an important role in sociosexual communication. It is a universal desire to retain a flawless fair skin. To attain this, individuals are seeking faster and most effective ways for getting lighter skin tone. There are many products available over-the-counter like Hydroquinone, vitamin C serum, vitamin E, Niacinamide (Nicotinamide), glycolic acid, arbutin, Kojic acid and a few new products like pycnogenol, marine algae extracts, soy, Boswellia, etc. All are used in the form of local application. These products have variable effects from person to person. As systemic skin lightening agents various products are tried like l-cysteine peptide, Tranexamic acid, different plant extracts. But, glutathione has become more popular due to its fastest skin lightening action and also, because of wide social media coverage. Glutathione is a peptide derived from three amino acids glutamate, cysteine and glycine. It is a known antioxidant and detoxifies xenobiotics. Its skin lightening effect was detected incidentally. Skin lightening was noticed in a patient as a side effect of large doses of glutathione, which was given for some other disease and then onwards, it has become more popular as a skin lightening agent. How Does It Work as a Skin Lightening Agent? Is it safe to use IV Glutathione to get lighter skin? Tyrosinase is an enzyme, which helps in melanin synthesis (melanin is a pigment, which decides color of skin). Glutathione inhibits this enzyme, so less melanin is produced and skin becomes light. Besides this, it also switches production of eumelanin (produce dark brown color) to pheomelanin (produce yellow-red color), which leads to lightening of skin. Natural sources like tomato, orange, walnuts, whey protein, fresh fruits and green leafy vegetables are rich in glutathione. Various formulations like topical, oral and injectable forms are available. 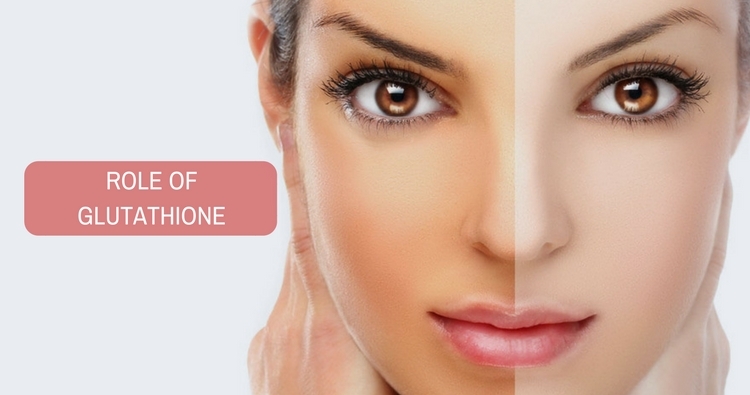 For local application like face wash cream, chemical peels containing glutathione are available. Use of these products show significant improvement in skin complexion. Oral preparations like tablet and solution forms are also available. The tablet if taken sublingual the absorption will be better and requires lower doses. The intravenous dose recommended is 600 -1200 mg once or twice in a week, but various adverse effects are reported with the intravenous route due to the possibilities of overdose toxicities or may be due to additives present in glutathione injections. Oral preparation has been recognized safe by FDA, but intravenous preparation can cause various adverse effects. The adverse effects reported with intravenous routes are thyroid dysfunction, kidney dysfunction and severe abdominal pain. The other adverse effects due to long-term high dose of glutathione supplements include lightening of hair color, light colored patches over the body and increased incidence of peptic ulceration. Do you have a question on Glutathione Pills or Skin Whitening Pill? How safe is it to use Glutathione capsules to improve skin complexion? How can I remove dark patches due to jock itch?